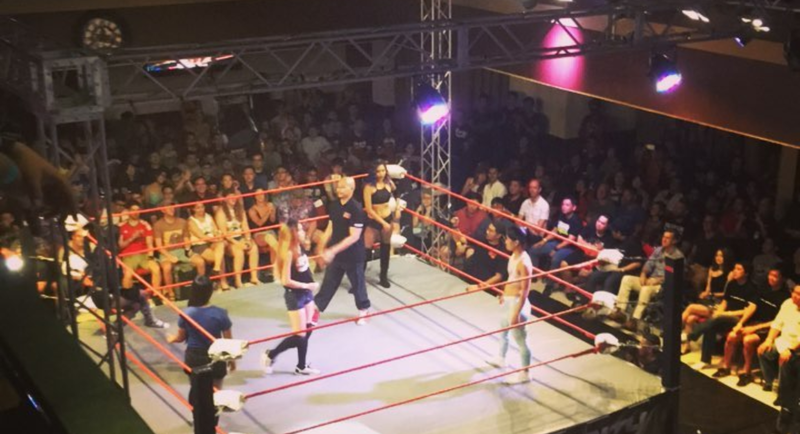 Despite all the excitement over the first-ever Wrestling Queen of Asia finally being crowned at WrestlingCity.Asia: Reload in Singapore last night, it seems that fans will have to wait a little longer to find out who the best woman wrestler in the region is. Apparently, the five-way elimination match, which featured Philippine Wrestling Revolution talent Crystal going up against All Action Wrestling Women's Champion "The Lion City Hit Girl" Alexis Lee, SPW newcomer Jane Foo, Malaysia Pro-Wrestling representative Poppy, and Thailand-based Jibzy, ended in a disappointing no-contest thanks to a surprise run-in from an unannounced grappler. The match opened slow, with the ladies taking turns with the spotlight in the ring, generally only having two competitors in the ring at any time. Crystal and Lee were clearly trying to upstage each other as alpha females in the match, only to be interrupted and dumped out of the ring unceremoniously by Foo and Jibzy. The Singaporean rookie impressed with her springiness, including a step-up Fame Asser, only to be pinned after a series of vertical suplexes. Jibzy eliminates Jane Foo. The action then ramped up a notch, with Crystal flying high to wipe out the three other ladies, but the Lion City Hit Girl outdid her with a double headscissors-bulldog takedown of Jibzy and Poppy. Some nice double-team action by Jibzy and Poppy had the Singaporean star reeling, only for Poppy to betray the temporary alliance. A vicious Shining Wizard was enough to stun Jibzy for the three-count. Poppy eliminates Jibzy. Poppy and Crystal exchanged finisher counters until getting interrupted by Lee. She had Poppy sliced in half after catching her off-guard with a vicious spear, only for Crystal to toss her out of the ring and steal the pinfall for herself. Crystal eliminates Poppy. The match was down to Crystal and Lee as the final two, with the two women buckling down with a strong-style exchange of forearm shots and stiff slaps. But before things could truly escalate, the two were interrupted by the primal screams of Russian-based IWF star "The Queen of Scream" Kasey, who marched down to the ring and proceeded to destroy the two weary battlers. A swinging reverse STO pulverized Alexis Lee, while a top-rope missile dropkick had Crystal flat on her back. The Russian veteran then left the ring as her music played, and the Queen of Asia Championship held hostage. Now I'm not only the Queen of Scream, but also the Queen of Asia😈😍 Nobody but me deserves this title!!! The referee determined that neither Lee nor Crystal could continue. No-contest due to Kasey interference. No word yet on how the promotion plans to resolve the championship situation, but we'll be sure to keep you all updated. Meanwhile, we'll let Crystal's stunned reaction on social media speak for us all here at the Smark Henry offices. Photos by Instagram user @prodigalgeek and Ken Lui of SportSoho.com.